There are almost 100 ghats—places with steps leading down to the water—along the Ganges River in Varanasi. The main group contains around 25 of them, and it extends from Assi Ghat north to Raj Ghat. The ghats are primarily used for bathing and puja rituals (worship), but there are two (Manikarnika and Harishchandra ghats) where cremations are solely performed. 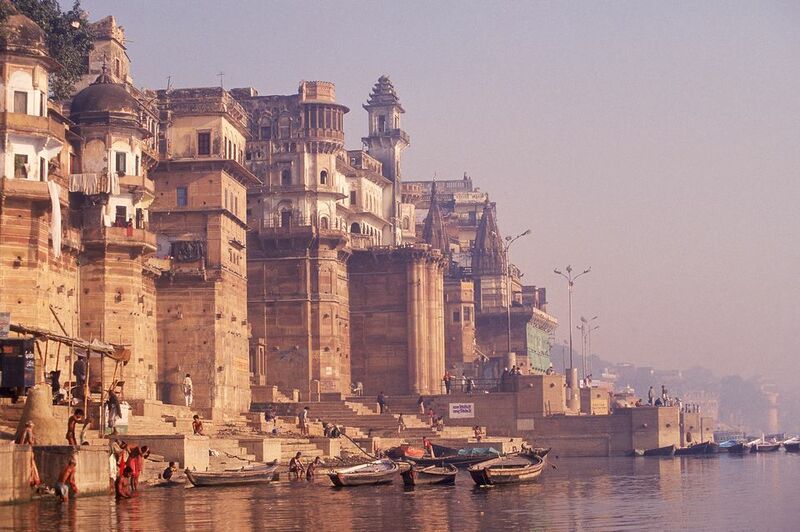 Many of the ghats were constructed when Varanasi was substantially rebuilt under the Maratha Empire in the 1700s. They are either privately owned or have special significance in Hindu mythology. A highly recommended, although touristy, thing to do is take a dawn boat ride along the river from Dasaswamedh Ghat to Harishchandra Ghat. A walk along the Varanasi ghats is also a fascinating experience (although do be prepared for filth and to be hassled by vendors). If you're feeling a bit daunted and would prefer to be accompanied by a guide, go on this riverside walking tour offered by Varanasi Magic. You'll find Assi Ghat where the Ganges River meets the river Assi. It's located at the extreme southern end of the city, and hence it's not as crowded and chaotic as some of the other ghats. However, it is an important ghat for Hindus. Pilgrims bathe there before worshiping Lord Shiva, in the form of huge lingam under a nearby pipal tree. There are quite a few interesting shops and decent cafes (head to ​Vaatika Cafe for pasta and pizza with a great outlook) in the area. The ghat is a popular place for long-staying travelers. Dasaswamedh Ghat is a 30-minute walk away, along the ghats. Chet Singh Ghat has quite a bit of historical importance. It was the site of the 18th century battle between Maharaja Chet Singh, who ruled Varanasi, and the British. Chet Singh built a small fortress at the ghat but unfortunately, he was defeated by the British, who captured the fort and imprisoned him in it. Apparently, he managed to escape using a rope made of turbans. Dasaswamedh Ghat is the heart of the action and the top attraction in Varanasi. One of the oldest and holiest Varanasi ghats, it's where the famous Ganga aarti takes place every evening. According to Hindu mythology, Lord Brahma created the ghat to welcome Lord Shiva. Lord Brahma is also believed to have performed a special horse sacrifice ritual there in front of a sacred fire. The carnival of goings-on, with a constant flow of pilgrims, Hindu priests, flower sellers and beggars from dawn til dusk, is absorbing. It's possible to sit and watch for hours, and not get bored. There's also a hectic marketplace around the ghat. Darbhanga Ghat is a photogenic favorite! It's one of the most visually appealing, and architecturally impressive, ghats. It features an imposing palace hotel that you can stay in. It was built in the early 1900s by the royal family of Bihar. Adjoining it is Munshi Ghat, constructed in 1912 by Sridhara Narayana Munshi, finance minister of the State of Darbhanga. Scindhia Ghat is quite a picturesque and peaceful place, with none of the grimness of nearby Manikarnika Ghat (the burning ghat). Of particular interest is the partially submerged Shiva Temple at the water's edge. It sunk during the construction of the ghat in 1830. The narrow maze of alleyways above the ghat hides a number of Varanasi's important temples. This area is called Sidha Kshetra and it attracts plenty of pilgrims. Another very old Varanasi ghat, Man Mandir Ghat is notable for its exquisite Rajput architecture. Rajput Maharajah Man Singh of Jaipur built his palace there in 1600. An additional attraction, the observatory, was added in the 1730s by Sawai Jai Singh II. The astronomical instruments are still in good condition and it's possible to take a look at them. Head up to the spacious terrace for fabulous views of both banks of the Ganges River. Distinctive looking Bhonsale Ghat was built in 1780 by Maratha king Bhonsale of Nagpur. It's a substantial stone building with small artistic windows at the top, and three heritage temples—Lakshminarayan Temple, Yameshwar Temple and Yamaditya Temple. Quite a bit of controversy surrounds this ghat, with the royal family being embroiled in a fraud case over the sale of the ghat in 2013. The most confronting ghat, Manikarnika (also known simply as the burning ghat) is the place where the majority of dead bodies are cremated in Varanasi. Hindus believe it will liberate them from the cycle of death and rebirth. Indeed, you'll openly come face to face with death at Manikarnika Ghat. Piles of firewood line the shore and the fires continually burn with the stream of dead bodies, each wrapped in cloth and carried through the lanes on makeshift stretchers by the doms (a caste of untouchables that handles the corpses and supervises the burning ghat). If you're curious and feeling bold, it is possible to watch the cremations take place for a fee. There are plenty of priests or guides around who will lead you to one of the upper floors of a nearby building. Make sure you negotiate and don't give in to demands for outrageously high sums of money. You can also find out more about the cremations on this insightful Learning and Burning walking tour offered by Heritage Walk Varanasi and Death and Rebirth in Banaras walking tour offered by Varanasi Walks.